World Mental Health Month’s theme for 2018 was ‘Mental Health In Youth and Suicide Prevention’, India is highest in youth suicide in the world and major cause is mental illness connected with emotional and relational changes in the youth / adolescents. Impulsive suicide is second largest cause for death in India among youth. Through research conducted by Ministry of Health, Govt. of India multiple factors affects youth mental health and gender specific issues were also been observed. Self Image, romantic relationship, peer pressure, educational boredom, addiction and depression are the leading cause of mental health issues in youth of India. At, the MINDS foundation we are focused on these issues and lined up our mental health awareness program for this year youth and adolescent specific. at our field intervention areas we have collaborated with local Govt. Hospital and Psychiatry departments to reach out to general public and create mental health awareness particularly in youth and adolescents. 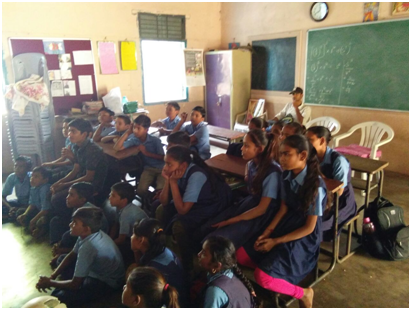 We at MINDS Foundation, begun with conducting school mental health awareness program at grassroots and interior Taluka and Villages of our intervention area in Gujarat India. In the Month of October 2018, we were able to reach out to 1100 students in schools and 200 health workers and 240 Nursing students. Our Program Director was honored for the mental health session by H.o.D psychiatry – Govt. General Hospital – Bhavnagar Dr. Bharat Panchal. MINDS program director Amul Joshi and summer fellow Abigail Warren travelled to the district of Chhota Udepur, Gujarat to visit a number of villagers who had been sought out and treated by MINDS staff. The ride to the villages was long, but scenic and luckily the rain held off until the final portion of the journey home. The man pictured below, Sanjaybhai Tadvi lives in the village of Bahardarbur. Sanjay was diagnosed with epilepsy about seven years ago when, in collaboration with Dhiraj General Hospital’s Department of Psychiatry, the MINDS Foundation conducted a community mental health awareness program in Bahadarpur Village. Part of the MINDS mission is to retain patients and encourage them to complete treatment. Mr. Tadvi in particular was provided with logistical support, doctor consultations, medicine, in-patient services, and follow up visits at his home to assess mental health improvements and provide counselling at no cost via MINDS. From 2011 to 2016, the MINDS Foundation identified 153 mentally ill patients and provided them with access to care. Most patients completed treatment and are currently doing well. A visit to Sanjay’s home on the 14th of July found him at home and helping his mother with domestic work. Sanjay is facing financial difficulties as he is not able to work because he has to take care of his mother who cannot walk on her own. Sanjay told us that he helps his mother by buying groceries and household things from the market and community members often chip in to help. Sanjay informed MINDS staff that he is doing okay despite his financial issues. Joshi assured him that he should continue consultation since travel to and from the hospital as well as meal costs will be provided. Fortunately, Sanjay has been able to sustain his mental health with the help of MINDS since 2011! On Wednesday, July 4th, summer fellow Abigail Warren and social worker Foram Chaudbry went to The Bright Day School in Vadodara to deliver a presentation they have curated to 40 eighth grade students. By educating the students on mental health and emotional management, Warren hopes to make it easier for students to realize that it’s normal to feel stressed from the pressures of school, their families etc and learn how to deal with issues rather than letting them become a great part of their lives. Responses to the mindfulness activities and educational presentation were extremely positive. Teacher Vidya Sudhish reported that the activities conducted “really helped the students to value themselves and others.” The session worked to achieve MINDS’s goal of spreading awareness surrounding mental health; Headmistress Rashana Shah said that the it increased both her and the students’ knowledge on mental health “which will indirectly help all of us to deal with stress or sadness in our daily routines.” The pair hopes to reach more of the urban population around Vadodara and will be visiting more schools in the coming month. “Suicide Perceptions among adolescents” a comprehensive research study. Masters of public health students Ms. Chloe Deflorimonte and Ms. Vaidehi Jokhakar along with their external guide Dr. Elizabeth Viscegllia from Mount Sinai Hospital, New York. The research study aims to understand attitudes towards mental health and suicide perception among adolescents in Gujarat. Research team interacting with student on her perceptions about Suicide and mental health attitudes. The research fellows came to The MINDS Foundation Vadodara Site and will stay at the facility for eight weeks starting from June 22nd, 2018. The objective of the study is to understand perceptions of suicide in students and to provide emergency response to students who were found with mental health issues through this study. The study consists of formal questionnaire filling for participants and a semi-structured interview with individual students to understand more about their mental health needs and preventive ideas for suicidal idealization. The outcome of the research will help The MINDS Foundation develop a need based program regarding mental health awareness in communities that we are currently working with. Also, this research would not be possible without our third academic partner GMERS Gotri General Hospital Vadodara, Dept. of Psychiatry and we are particularly thankful for Dr. Sandip Shah H.O.D dept of Psychiatry to provide an ethics approval in very short time and with special provisions. 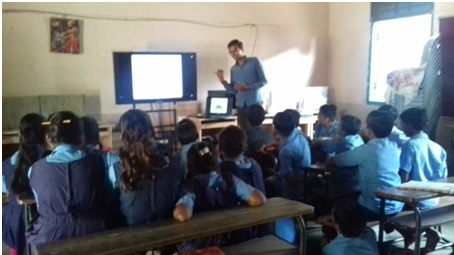 The MINDS Foundation Vadodara team had conducted a School Mental Health Awareness Programme in Darapura Primary School in December 2017, and after this awareness program one of the teachers of primary school had referred one patient to our organisation who is suffering from mental illness. The age of the patient is 42 and he lives in Anand district. He has been taking a treatment and medicine from Gotri hospital since January2018. The MINDS Vadodara team is having a good rapport with the family members of this patient and also had a deep conversation with the mother of the patient. The patient is having the mental illness from past 15-16 years, and also previously he was going to the private doctor but because of too much expense they started coming to the Gotri hospital, Vadodara through MINDS Foundation. According to his mother the genesis behind the patient’s mental illness was his marital life and family problems, she believes that because of his wife he used to get aggressive so that is why the patient divorced with his wife and again he got married with another woman. The patient’s mental condition has very much improved as he is on medication and treatment from last 3 months. The patient and his mother regularly visit the Gotri hospital every month to meet the doctor and for medicines. How to manage post board exam stress and anxiety! We get lot of support services and information about preparing for board exams nicely. But not much aware of the issues after the board exams. These post board exam stress and anxiety issues are common among students and many of them gets longer deal with overcoming this emotional and mental conditions. We have plenty of information and guidelines being released by the education board. We do participate in counseling and guidance sessions for excellent exam preparations and try to give our best. As parents its quite obvious to prioritize student’s exam schedule and focused on student’s sleeping, eating and reading routines. We encourage our child to give more push for reading and memorizing the subjects and try to look in to IMPs. However, we do not pay attention to child’s overall physical and mental well-being during the exam period. These stimulated or say very controlled environment created burnout situations for students and that leads them with different vulnerabilities. Mental health issues of board examiners often seen as excuse, less preparation for scoring subject or lack of sincerity and hard-work for the exam. However, these kinds of mindset and attitudes of the parents, peers and siblings towards child affects the overall mental health and leads to greater risk of depression, anxiety or common stress. We are all well aware that, not immediately after the exams but in nearer time when the results are about to announce. Students with severe mental health conditions commits suicide, tries to commit suicide, makes escape plan, gets severely ill with no actual symptoms, tries to harm themselves with sharp objects or simply run away from home. And students do it even before the result is not declared, because of POST EXAM STRESS and MENTAL HEALTH CONDITIONS. Following are some of the important tips as Do’s and Don’ts for students and parents to cope up with post exam stress. This is what normally students do just after their exam was over and look into their notes to compare their exam wrote-ups / MCQ answers with actual or correct answers to compare. Particularly for scoring subjects like maths, chemistry or physics, accounting and for language papers, students tries to review what they will score based on their performance in exam. Around 15% to 25% of this comparative reviews are incorrect and doesn’t match with actual exam paper performance. Also, it only increase stress and anxiety for those students who find their answer wrong, half-written and assumed to be incorrect. These kind of issues are quite common with language, theoretic papers. Instead searching for answers students should have a positive discussion among group of friends and feel confident about what they have written and should focus on next steps and should engage themselves in some routine or vacation activities. To stay away from repetitive thoughts on bad exam performance or assumptions that creates more stress. Do – engage your self in activities you enjoy as a part of break from study, holiday or vacation! By putting yourself in to some enjoyable activity, you will gain energy and enthusiasm our of your past routine of tight reading and exam preparations. More of a physical activity like playing favourite game for few hours a week, listening to favourite music, doing arts and crafts, getting off to some new locations, travelling and exploring will boost your inner as well as outer personality. Will ease your mental and physical burnouts that you had faced during exam times. While doing self enjoyment activities, we insist to give enough time for meditation and yoga, at least 30 minutes a day for mediation and few ASANAS of Yoga will help develop better physical and mental posture. Particularly, for those students who are already having mental health issues, depression or mood disorders, anxiety issues will get relief. Do Not – doubt on your abilities and do not limit by your last exam performance! Always remember and believe that, there’s always a fair chance and an opportunity again where you will be able to perform well / excellent. You should not loose hope for the some portion of the exam you were not able to write properly or missed. You can not change your past but you can correct your present and can be ready for your future for next bit of challenge in life. One shall not doubt its abilities, by just board exam. Board examination is one stage of life and you either do it well or look for next stage do do better. Creating doubts on our own because of other’s negative perception or comments is harmful. Instead one should create optimism by exam performance and should appraise and appreciate for doing well. Do – begin doing routine exercise, keep away from toxic (-Ve) people and talks. Start helping you family, help your mother in housekeeping, help your father in grocery shopping. Help your siblings in doing housework or other co-curricular work. keep yourself busy with some productive activity by end of day. This will help you keep up the routine and will give you good sleep. keep away from people who scare you, feel you uncomfortable about your exam or about exam results. Do not share your exam experience, your performance before toxic or negative people, as their views and comments will make you disturbed and if you are already having stress or anxiety issues it will increase your mental health problems. Instead spend time with people who inspired you, let you feel proud of yourself and have faith in your ability. Community Mental Health Awareness in Rural area – A Challenge! The MINDS Foundation has developed five year strategic plan after it’s board meeting held in January 2018 at Mumbai before Trustees and Promoters. Inline with commitment shown to the MINDS Board and brought out a vision for the foundation. A time-line document has been developed, which is a target based interventions with particular tasks in each program. For 2018, the MINDS Foundation aims to reach 125 rural villages, communities and clusters to address mental health issues among general population. Through our essential mental health interventions we want to provide access to care to rural households. For this we have recently conducted our this year’s first two sessions of community mental health awareness. At village Darjipura and Fatehpura of Padra Taluka of Vadodara District. This indeed a challenging tasks to provide mental health education to village communities. It all starts with round of visits, rapport building with leading stakeholders of the villages, creating resources, providing strong introduction and information about the MINDS Foundation and program objectives. After scheduling a date and time, it’s not a sure that the people will come-up to participate due to stigma around mental health and also ignorance of this important issue. So after the invitation, the field staff has to make sure they are meeting each and every household of the village and invite them to participate in the awareness program. The mental health awareness program includes, 30 minutes of the presentation on mental health awareness covering variety of subject / topic and 30 minutes of the video play (showing a mental health education movie and a story of a adolescent get mental health issues and overcome of it with proper treatment and care). Our recent experience at village Darjipura and Fatehpura gave us confident that there is lot more to do to reach more communities as possible and provide them quality knowledge about mental health and develop resource for care and treatment. Year 2017-2018 is a value edition to The MINDS Foundation’s mental health philosophy. The Foundation was successfully able to do expansion of its mental health interventions in to other districts of the Gujarat. School mental health education for adolescents and teachers was launched in mid 2017, and successfully reached to 24 schools of Bhavnagar District provided mental health education to 3900 students and 370 Teachers. Post school exams and summer vacation of 2018, the MINDS Foundation team aims to reach more semi-urban and rural area schools across Bhavnagar and Amreli District. Further to this intervention the MINDS Foundation has got opportunity to work with the Sir T. General Hospital’s Dept. of Psychiatry Doctors. Who will work closely with the field team in organizing mental health awareness camp in communities and will provide necessary adherence for the treatment. This collaboration is also expected to get strong and supportive to work on different mental health service model that helps the different and unique needs of the people, patient and different age groups. The MINDS Foundation also anticipating partnership in south Gujarat area with some of the like minded organisation and mental health foundations as a part of expansion. For more updates do visit our website http://www.mindsfoundation.org and keep reading newer blogs on the MINDS foundation developments. The Mental Health improvements initiative in community and schools are leading program the MINDS Foundation is delivering to reduce the stigma and discrimination around mental health and people suffering from mental illness. Students, are more vulnerable to mental health issues due to variety of reasons, be it hormonal changes, puberty period, educational boredom, peers pressure, social and family life issues and self image, romantic relationship issues. The School Mental Health Education Programs of the MINDS foundation helps adolescents (students) to understand factors affecting mental health and breaking the stigma around it. The program delivery imparts knowledge on how the stress, anxiety and depression can be reduced with right help, talking about mental illness and one’s feelings and asking for help. The program encourages students to stop bullying and treat children with special need / their colleague equally and with empathetic support. Educational, personal and personality related counseling also been provided during the school mental health education programs. sharing herewith the recent program details that held at Talsat Village, in Vadodara District of Gujarat. MINDS dedicated field social worker’s have delivered the program using sensitization and strong appealing skills to eradicate mental health misconception from students and ensured teachers to be torch bearing person to help student in difficult circumstances to address mental health and provide with counseling and treatment. will continue with more positive stories from the field….